It's important to make healthy food choices during pregnancy since your baby relies on your food intake for nourishment. It is also important to avoid foods that might be contaminated with bacteria or toxins. Thankfully for fans of yogurt, fat-free yogurt is nutritious and generally safe for you and your baby during pregnancy. During pregnancy, you need to provide your body with the building blocks it needs to produce cells and new tissues. Carbohydrates, proteins and fats contain these building blocks and also provide energy for your body. The healthiest pregnancy diet consists of foods low in unhealthy saturated fats and added sugars and high in lean protein and quality carbohydrates, explains Miriam Stoppard, M.D., in her book "Conception, Pregnancy and Birth." Fat-free yogurt is a healthy choice during pregnancy. While full-fat yogurt is high in saturated fat, yogurt made from fat-free or low-fat milk contains all of the high quality carbohydrates and proteins found in yogurt, without the fat. 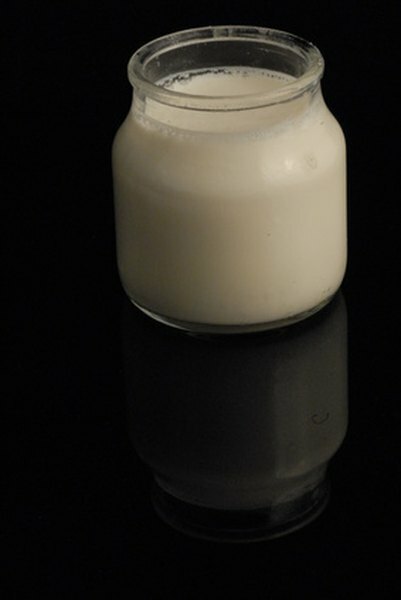 Further, yogurt is a natural source of lactobacillus acidophilus bacteria. When consumed regularly, these healthy bacteria can help prevent yeast infections, which are common during pregnancy, notes a 1992 study published in the "Annals of Internal Medicine" by Eileen Hilton, M.D., and colleagues. While yogurt is generally healthy and safe during pregnancy, it's important to consume only yogurt made from pasteurized milk. Yogurt from raw milk may contain bacteria that is unsafe for your developing baby as it crosses the placenta, explains Heidi Murkoff and Sharon Mazel in the popular pregnancy book "What To Expect When You're Expecting." Since unpasteurized yogurt is rare in United States commercial grocery stores, you are unlikely to come across it, but be sure to read labels beforehand. Some fat-free yogurts contain artificial sweeteners to further reduce the caloric content. These sweeteners, including aspartame and sucralose, appear to be safe for healthy adults; however, they haven't been proven safe for pregnant women. As such, you should avoid artificial sweeteners during pregnancy. Look for fat-free yogurt sweetened with natural sweeteners, such as fruit or sugar, or choose the unsweetened varieties.